Philadelphia Web Design Case Study – Ron Brown Scholar Program How Do I Start Marketing My Business on the Internet? New Website Design for House of Shine Blog by Yves A. Martin Consulting, LLC. Forums for their users to interact. Ecommerce so they could monetize their efforts. A robust content management system so they could manage their own site. The foundation on which a website is built is the content management system. The right choice in content management system mean the website will be easy to update and can be extended with functionality beyond static web pages. For this project Yves A Martin Consulting, LLC. chose to use the Dotnetnuke content management system. Dotnetnuke is a premiere open source content management system with a large community of support and market of pre-made functionality modules. 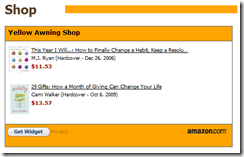 This makes it easy and inexpensive to add functionality such as ecommerce, forums and blogging. Dotnetnuke also supports basic content management and membership functions right out of the box. This made it the ideal solution for this project. The House of Shine team wanted more interactivity on their site so we suggested they add a forum to the website. 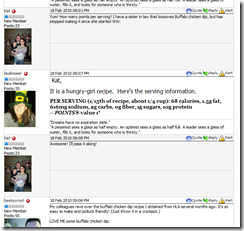 A forum is a web 2.0 tool that allows users to post topics for discussion and allows other users to comment on the topic. In this way conversations are carried on via the website. 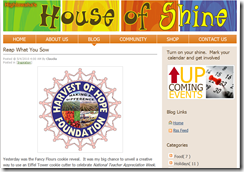 Click here to see the House of Shine forum. Pictured above a user creates a topic and posts a communication. Below users join in the conversation. 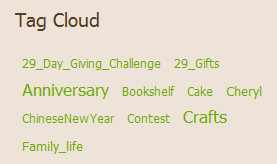 A tag cloud is fun and visually attractive feature that can be placed on the website to show users what other content the blog contains so that after reading the most recent post they can also explore other posts in the site that might interest them. Incorporating a search for the blog was key so that users can easily find content based on keywords or phrases. 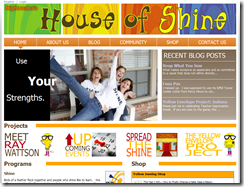 The House of Shine team in growing from originally be just a blog website to becoming a community website with ecommerce and other features want to make sure that the blog is still prominently featured on the site. Being able to link in an attractive way to the most recent blog posts from other pages on the site is a great way to keep the blog easily accessible from all page on the site. 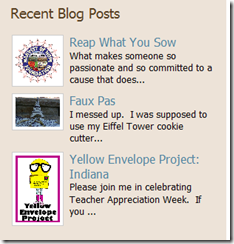 Image above shows the “Recent Blog Post” module on the home page that automatically features the most recent blog posts as soon as they are published. 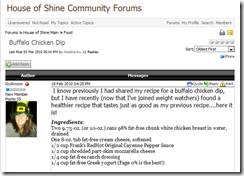 Below is the module that promotes the recent blog posts on content pages. Again the content is updated automatically with the content management system generating the thumbnail image and text. With this functionality the blog is constantly promoted through out the site without requiring any manual content updates. 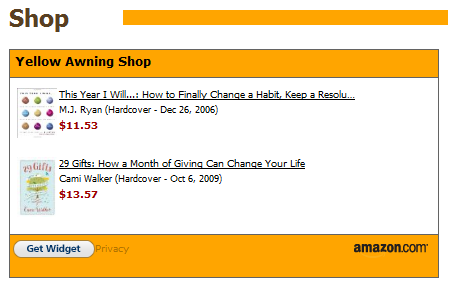 The House of Shine community likes to read and recommend books and a great way for the House of Shine team to get money to support their efforts as well as getting great deals for their members is to integrate an Amazon.com affiliate widget on their site. This way members can easily purchase recommended books, as well as other recommended products, and in doing so help support the community. 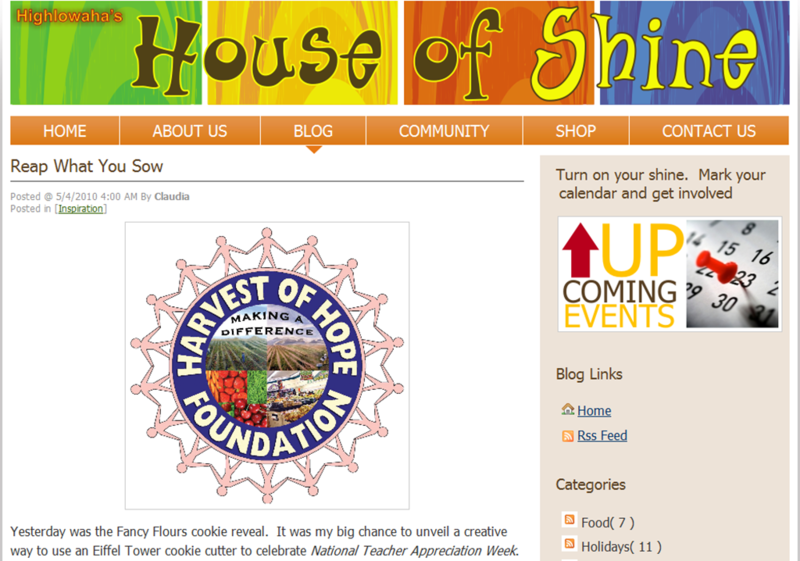 The House of Shine team also have branded items that they want to sell to support their community. They wanted a robust shopping cart to integrate in their site that would work with Paypal to collect payments. The Yves A Martin Consulting, LLC. ecommerce team found a great module to add to the Dotnetnuke content management system that allowed simple shopping cart integration with the site. 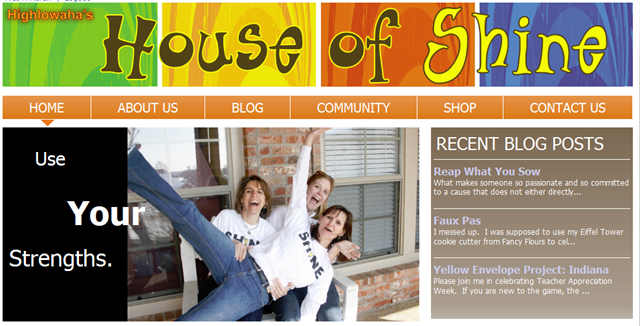 The House of Shine team can now easily add products to their store and feature items throughout their site. This is a great example of the type of multi-faceted web design project that the web design team at Yves A Martin Consulting, LLC. is the perfect partner for. 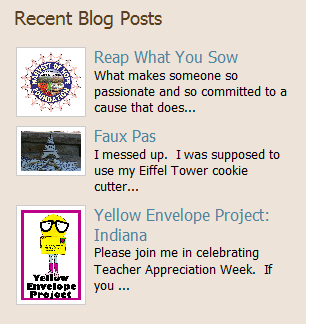 Brilliant blog, I hadn’t noticed yamcllc.com earlier during my searches! Thank you for keeping us updated. I really enjoy it and discover all of the information really helpful. Excellent post, I discovered your website via Google. I bookmarked your website for furture infomation, many thanks.